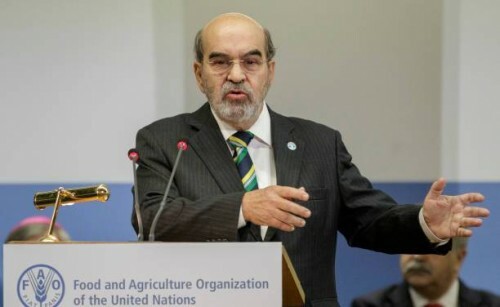 Paris : Agriculture plays a vital role in averting conflict and promoting lasting peace, United Nations Food and Agriculture Organisation chief Jose Graziano da Silva said on Thursday, stressing how warfare worsens global hunger. "Hunger and peace are closely linked. Conflicts have a major impact on local food systems," he said in a keynote address at a meeting here on agriculture, defence, diplomacy and development. "They contribute to the worsening of hunger in the world," Graziano da Silva told the forum organised by the French Foreign Ministry and the 52-member international agri-food group Club Demeter. "But we must keep hope alive. "Even in areas worst hit by violence, farmers, herders and fishers continue to produce food," he said. Almost half the population of violence-hit countries lives in rural areas, where livelihoods largely depend on agriculture, according to FAO. Hunger is on the rise and one of its main driving factors is conflict, according to two recent FAO-led reports, the State of the World's Food Security and Nutrition (2017) and the Global Report on Food Crises (2018). Citing the example of South Sudan, which he visited last year, Graziano da Silva said nations need to keep funding the "resilience capacity" of farmers and herders who are producing food in the most adverse circumstances. "Once local food systems are broken, it is more difficult to rebuild," he warned, urging humanitarian organisations and those in the development sector to strive for peace through stronger partnerships. "Humanitarian action, while fundamental, is not enough," he said. "It alone cannot stop this trend of worsening food crises... To this must be added actions for sustainable development to generate new opportunities." Building increased resilience among rural populations and offering "legitimate livelihood options" especially to young people is crucial to prevent their enrolment in armed groups or migration, Graziano Da Silva contended. "The employment of young people and women is a crucial element of FAO's efforts to combat hunger in conflict contexts," he underlined. In Niger, France's support to FAO and the World Food Programme has allowed the UN agency to offer work to young people and women in the agri-food sector, staunching the flow of people leaving their land, he said. "If agricultural activities are not supported, more and more farmers, shepherds and fishermen will have no choice but to abandon their land to migrate to other countries. What is a shepherd without his goats? A potential migrant."